another attempt at do we depend on our D tech a little toomuch!!! I had a whole blog post written up about my recent experience with Dka and pump silent occlusions. It got deleted by accident so I’m going to attempt to paraphrase my words to get the point across while delving into our dependence on D tech as a whole. Here goes, AGAIN!!! Recently, at a Diabetes conference as a group we were talking about the impact of closed loop systems on our daily D management. A new D friend brought up an interesting point that I now find myself pondering due to recent medical events in my life. If I can summarize what he asked, he talked about how relying on D tech, including bolus wizard pump calculations of insulin dose amounts due to insulin to carb ratios, as well as the algorithms in the closed loop systems, allowing our ability to figure out how to independently figure out our own insulin doses decrease and become nonexistent? Are we allowing a “dumbing down” for lack of a better term, of our own abilities to figure out these parameters on our own! It brings up a good point. In recent weeks I found myself experiencing DKA & several unexplained hyperglycemia episodes which I believe were ultimately due to what’s called, ” silent occlusion” where my pump failed to notice these partial occlusion in which my infusion sets failed due to kinking of the cannula! On 2 different occasions my glucose was in excess of 570 & due to a problem w my CGM sensors and transmitters at the same time, I was unable to treat these highs in a timely fashion. Once I experienced full blown DKA, spilling large blood ketones as measured by my blood ketone meter. And the second time my ketones were measuring small so it was believed we caught the problem before it got out of hand. Both times the hyperglycemia required a trip to the local ER as well as hospitalization & IV insulin, as I was experiencing EXTREME nausea & vomiting as well as the out of control abdominal pain! 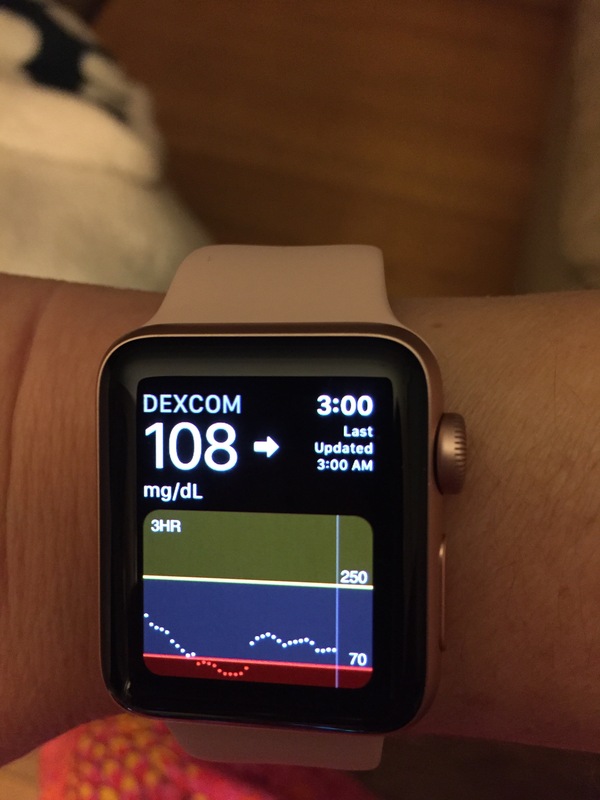 These episodes came out of no where & I did not have the preventive knowledge that my Dexcom CGM would have provided due to a malfunction of my CGM transmitter. I was waiting for Dexcom to replace my transmitters so other than a point in time bg meter value, I had no idea I was headed toward DKA. It was a perfect storm of sorts. The frustrating part was I had been in close contact with my endo’s convering doc & had tried a “virgin” insulin injection doses w a syringe using the same insulin in my pump so I knew that the insulin wasn’t the problem. Both times, I removed and reinserted in a different spot my infusion set to help remedy the problem to no avail!! It was incredible that I called Medtronics to help me w my pump Saturday morning ,spending over an hour on the phone, only to have them reassure me “everything is fine! U can continue to use it!! ” Hearing this, I neglected to listen to my gut and that of the covering endo, and continued to use my pump!! Can u say DENIAL!!! I feel I wanted to believe it was ok!! I went against even the positive outcomes of a drop in my blood sugar after I bolussd w a syringe!! I could kick myself now. Fast forward to Saturday at 4pm & my BG was now over 450 despite it coming down to 273 with a virgin dose of injected insulin!! And at this point I had changed my infusion set several times only to find the canula bent on two occasions which totally pointed to my pump not detecting my sites not delivering the vorrect amount of insulin. This is the definition of a silent occlusion. By Saturday afternoon unbeknownst to me I was in full blown DKA experiencing severe, unrelenting, continuous nausea & vomiting, plus EXCRUCIATING abdominal pain unlike any I had experienced in my life with long standing chronic pancreatitis. Never mind the mind numbing thirst and peeing up a storm. I ended up going to the ER & being admitted for management of my DKA. As a relatively new PWD, this was my first experience w DKA! I TRULY had no idea what was happening!! The second episode happened along side of another medical problem but my ketones were only moderate despite the same nausea, vomiting and Abdominal pain. After I got home from each admission, I swore to myself I would NEVER rely on a piece of equipment again for my day to day management. After only a couple days on injections and less then stellar average bg numbers, every time it was time to give myself a dose of insulin, I would reach for my waistband to retrieve my pump to bolus. It was then I realized, I’m a pump girl & despite my experiences I would always be a pump girl, although I would be a much more careful pump user!!! So the Monday morning I was home from the hospital, I was on the phone placing my order for a replacement pump. And now I’m glad I did not let the fear paralyze me. This brings me to my questions…did I rely to complacently & completely unaware and in denial of the downfalls of relying on a machine to take care of me!! And do I rely too much on my CGM to warn me of troublesome patterns?? Should I just go back to what I consider primitive methods of handling dealing w my blood sugars!! I believe for me the answert to that is no!! I enjoy pump therapy and my Dexcom CGM have been a game changer for me in my day to day management!! But I can say I have been & will continue to be mindful of manmade technology & its limitations, all the while taking steps to double check the pump & CGM’s math all along the way!! Right now, I’m still dealing with the stress of these two incidents & am being OBSSESSIVE about double checking my numbers & suggested doses just to be safe. But I’m hoping as time passes & I become more comfortable, yet not complacent w my D tech, that I can find a happy balance between using my D tech as well as using my God given brain to double check to make sure all is right in my D world!! That being said, look what I added to my daily management…am I crazy!! YES!! But that’s despite the point!! I’m looking to make use of what is available to me in an attempt to help me manage my BG, as long as I have a healthy dose of common sense along the way!! !